It has been a turbulent year for extractives governance, bringing both setbacks and achievements. We have seen the White House and U.S. Congress abandon their leadership on extractives transparency under undue influence from several major oil companies that continue to cling to opacity. Just yesterday, the U.S. House Financial Services Committee voted to proceed with a bill to repeal the Dodd-Frank Act’s Section 1504, a 2010 anticorruption provision that requires oil, gas and mining companies to disclose the payments they make to governments for the right to extract natural resources. Members of Congress should not consider this bill any further. Instead, the U.S. Securities and Exchange Commission (charged with adopting new rules to implement Section 1504) should take inspiration from regulations in Europe and Canada. These laws have already prompted the disclosure of billions in payments from companies to governments, helping to deter corruption and improve resource governance. Outside the U.S., a few resource-rich, developing countries also chose to step away from global transparency initiatives. In these and other countries, civic space is increasingly under threat, and numerous corruption scandals have erupted. That said, there also is much cause for optimism. Today, we have access to more information than ever about the payments companies make to governments for subsoil resources. NRGI and its partners are navigating this “data deluge” and learning much in the process. NRGI’s flagship 2017 Resource Governance Index (RGI) report revealed some key imperatives for our field. It showed that many countries are adopting appropriate regulations and laws to better govern resource extraction. However, a wide “implementation gap” remains, and becomes even more pronounced where corruption is rife. (We have been ramping up NRGI’s analytical and operational work on corruption, as exemplified by our guidance on corruption red flags.) 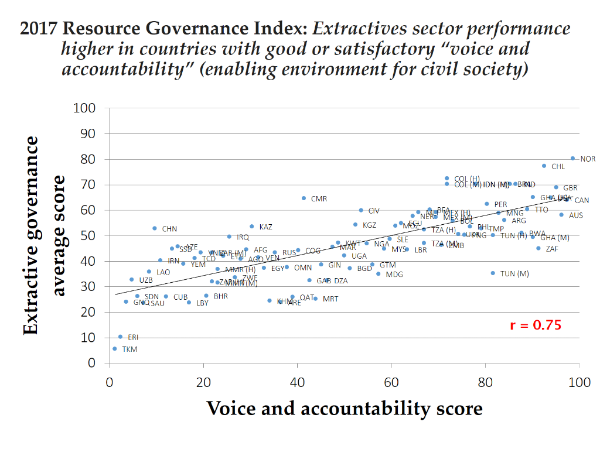 More broadly, the RGI underscores how critical protecting civic space is for improving governance in extractives (as suggested by the chart below), and also shows that state-owned enterprises and sovereign wealth funds require urgent reform. These are key priorities for us now and for 2018. Our work in resource-rich countries is at the core of what we do, and a number of countries made bold moves toward resource accountability this year. Mexico signed on to the Extractive Industries Transparency Initiative (EITI), and the country’s National Hydrocarbons Commission has become a champion of institutional transparency in extractives. The parliament of the Democratic Republic of Congo is now considering a much-improved mining code, on which we provided technical assistance. Countries where we work are also making progress on meeting contract and beneficial ownership disclosure commitments; we see this in the Kyrgyz Republic, Mongolia, Nigeria and Ukraine. NRGI continues to support the establishment of national extractive industry contract portals in Guinea and the DRC—as we had in the past in the Philippines, Sierra Leone and Tunisia—and we have supported the media’s role in improving resource governance in a number of African countries. In Tunisia, an NRGI report detailed steps for disclosure of oil, gas and mining contracts, and the government has since made over 150 contractual documents public. We have also addressed the changing role of civil society in responding to the extractives space in Latin America; Tanzania’s natural resources legislation and its offshore gas sector; and the mining divestment rule in Indonesia, among many other timely topics. We have ambitious plans for next year, and will take the power of data to the next level. We are poised to launch a national oil company database and accompanying analysis. We will use the RGI and NRGI-led platforms like ResourceContracts.org and ResourceProjects.org to forge new research, data and analysis. Our aim is to go well beyond accessibility, to make available data understandable, useable and actionable, thereby empowering agents of change. We will continue to innovate, growing our work on gender and sustainability, and incorporating the environmental and social impacts of extraction into our rigorous financial models, further contributing to evidence-based decision making in extractives. We will continue to speak truth to power, raising our voice to protect civic space, protect the gains made in transparency and accountability, and fight corruption. We will work toward further advancing the implementation of EITI, utilizing the initiative’s civil society safeguards when called for. Challenges to progress on governance—whether with respect to global norms or within countries—are part of the present-day reality that afflicts billions of people living in poverty around the world. These challenges deepen our passionate belief in our mission and push us to create innovative opportunities in our work with our partners. We thank you for your collaboration in 2017 and look forward to forging ahead in the coming months. We wish you a restful year-end and a brilliant start to 2018. 19 min 15 sec ago.